Extrasolar Storms: How's the Weather Way Out There? Orbiting the Earth 353 miles above the ground, the Hubble Space Telescope silently pivots toward its new target. At the same time, flying 93 million miles away in interplanetary space, NASA's Spitzer Space Telescope receives commands to point itself at the same celestial target. Precisely synchronized, both telescopes begin recording light at the same time from the same distant object: an exotic, purple-colored, cloudy, Jupiter-size world 24 light-years away, known as a brown dwarf. Using simultaneous observations from the two space telescopes, UA astronomers are tracking the evolution of the swirling clouds and storm systems in unprecedented detail on this brown dwarf and five others like it. The goal of the UA-led Extrasolar Storms campaign is to discover how clouds and weather systems change over time on other worlds. With brown dwarf cloud systems changing in minutes, hours and years, the galaxy looks like a dark and stormy place. "Brown dwarfs are similar to giant planets, but they are more massive and much hotter," says Daniel Apai, the principal investigator of the Extrasolar Storms project, who is an assistant professor at the UA's Department of Astronomy and Steward Observatory and the Department of Planetary Sciences. Apai leads a team of researchers that spans both UA departments as well as 15 different collaborators representing many different institutions, universities and NASA centers. Working together, Apai's team will study the observations from both space telescopes to investigate the physics and chemistry behind their stormy worlds. "Our current observing abilities cannot study extrasolar planets in very much detail because they're small, faint and far away," says Hao Yang, a postdoctoral researcher at Steward Observatory, who emigrated from China to Tucson in 2013 to join the Extrasolar Storms team. "On the other hand, brown dwarfs are bright, and Hubble and other telescopes can study brown dwarfs in detail and help us understand extrasolar planets." 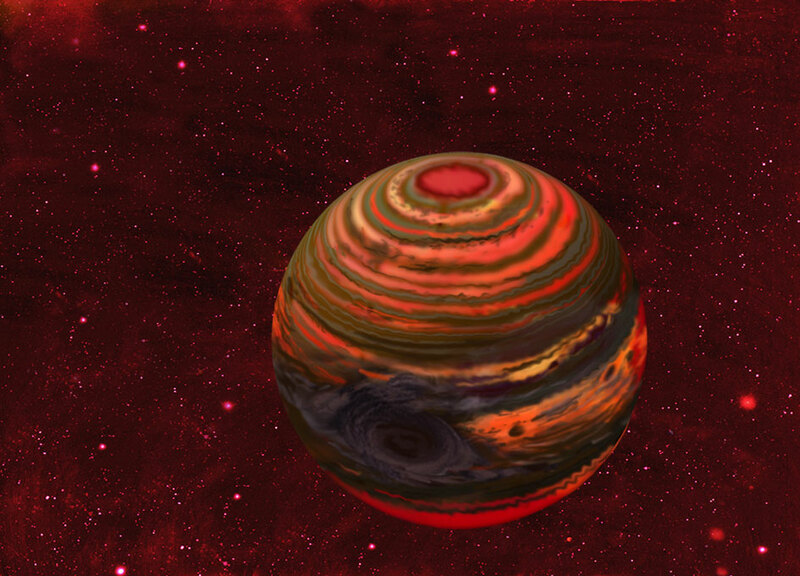 Brown dwarfs are much cooler than stars such as the sun, slowly shedding heat for the rest of their existence after quickly burning off what little nuclear fuel they had early in their lives. Glowing with temperatures that range from 3,100 degrees Fahrenheit down to room temperature and below, brown dwarfs litter our galaxy, the Milky Way. They remained hidden from view until about 20 years ago, when effective infrared telescopes were developed. "Most of the brown dwarf's radiation is invisible to humans eyes sort of like night vision," Yang says. At these temperatures, clouds condense in layers according to altitude. But unlike Earth's water vapor clouds, a brown dwarf's exotic clouds also can be composed of silicon, magnesium, aluminum and even iron. Astronomers think that a brown dwarf's atmosphere has winds howling at hundreds of miles per hour and can harbor enormous, hurricanelike storms spanning many Earths in size. In our own solar system, Jupiter's Great Red Spot, a giant storm system three times the size of Earth, has been observed for almost 200 years, and there is evidence that it may be at least 350 years old. Other, smaller spots in Jupiter's atmosphere seem to come and go at various times, sticking around for a month or even years before merging with each other or sputtering out. "A few years ago on Saturn, there was a major storm," Apai says. "It started as one small spot on the planet but then rapidly engulfed a quarter of the visible hemisphere." The data analyzed by the Extrasolar Storms team hints at similar cloud behavior many brown dwarf cloud patterns seem to stick around for years but galactic storm prediction can be as difficult as its earthly counterpart, surprising astronomers. "We have evidence of changes in these atmospheres from one hour to the next," Apai says. "We now know that these kind of rapid changes in cloud structures are very common." "One very exciting aspect of the program is that we have time on the Spitzer Space Telescope, but we also have observing time on the Hubble Space Telescope, the other Great Observatory of NASA. These are probably the most capable space telescopes. We need two facilities at the same time to look at the same target to monitor the cloud evolution because they can scan multiple layers simultaneously." A detailed look at how the "weather" on other worlds is behaving can be teased from the sensors onboard the Hubble Space Telescope, which spreads the light out into a spectrum onto its detector. "We take, say, 100 pictures of the invisible infrared rainbows of brown dwarfs and see how they change over time," Yang says. He then creates a time-lapse movie to see how features in these "rainbows" that correspond to compounds such as water and methane change over the course of hours, days and even months. The Spitzer Space Telescope follows the Earth in its orbit around the sun, and is as far away from the Earth as the sun a distance that keeps it away from contaminating sources of light and heat. Spitzer was built to work purely with infrared light and observes the light from a much cooler part of the atmosphere than Hubble. Spitzer observations can be particularly useful because NASA allows the Storms team continuous uninterrupted monitoring of the dwarfs for up to 24 hours at a time. Spitzer then revisits the dwarfs over the course of a year to track how the cloud patterns have changed. "With over 1,000 hours of telescope time, the Storms program is one of the largest programs approved on the Spitzer Space Telescope," Apai says. Even though the brown dwarfs studied in Extrasolar Storms lie nearby in the sun's galactic neighborhood, they are still too far to be seen as anything but a point of light. But that light can contain volumes of information about what the atmosphere is made of, and any cloud changes that are in progress. The light emitted from lower altitudes is altered when it passes through a higher cloud deck as seen from Earth. The composition and thickness of those cloud layers can reduce the dwarf's light when the clouds are thicker, or let more light through when a hole in the clouds appear. Every dwarf spins on its axis anywhere from once every few hours to up to 13 hours which creates a recurring change in brightness that can be recorded. Changes in this light rhythm because of clouds in different parts of the dwarf's atmosphere can be extreme, raising and lowering the amount of recorded light from less than 1 percent up to 27 percent in the case of one brown dwarf that is thought to have especially huge storms dwarfing Jupiter's Great Red Spot. The Storms team plans to follow up on these objects with even more observing time, tracking cloud activity of the more interesting objects for many years to come. The team also plans to expand its long-term monitoring to a number of other brown dwarfs of different temperatures. Apai sees a bright future for the astronomers studying stormy, cloudy worlds throughout the galaxy. "The technique that we're using in Extrasolar Storms and in other projects in my group is basically a technique that enables us to map other worlds. In the future hopefully, before I retire we can use this to map planets similar to Earth. We will be able to identify continents and oceans, which would provide very important context for looking for life on those targets."